NTLive: Antony & Cleopatra(Saturday only) Ralph Fiennes and Sophie Okonedo play Shakespeare’s famous fated couple in his great tragedy of politics, passion and power. Caesar and his assassins are dead. Gen. Mark Antony now rules alongside his fellow defenders of Rome. But at the fringes of a war-torn empire, the Egyptian Queen Cleopatra and Mark Antony have fallen fiercely in love. In a tragic fight between devotion and duty, obsession becomes a catalyst for war. Not rated. NTLive: The Madness of George III(Sunday only) It’s 1786, and King George III is the most powerful man in the world. But his behavior is becoming increasingly erratic as he succumbs to fits of lunacy. With the king’s mind unravelling at a dramatic pace, ambitious politicians and the scheming Prince of Wales threaten to undermine the power of the Crown, and expose the fine line between a king and a man. Not rated. Green BookWhen Tony Lip, a bouncer from an Italian-American neighborhood in the Bronx, is hired to drive Dr. Don Shirley, a world-class Black pianist, on a concert tour from Manhattan to the Deep South, they must rely on “The Green Book” to guide them to the few establishments that were then safe for African-Americans. Confronted with racism, danger-as well as unexpected humanity and humor-they are forced to set aside differences to survive and thrive on the journey of a lifetime. Rated PG-13. On the Basis of SexA true story that follows young lawyer Ruth Bader Ginsburg as she teams with her husband to bring a groundbreaking case before the U.S. Court of Appeals and overturn a century of gender discrimination. Rated PG-13. SerenityBaker Dill (Matthew McConaughey) is a fishing boat captain leading tours off a tranquil, tropical enclave called Plymouth Island. His quiet life is shattered, however, when his ex-wife Karen (Anne Hathaway) tracks him down with a desperate plea for help. 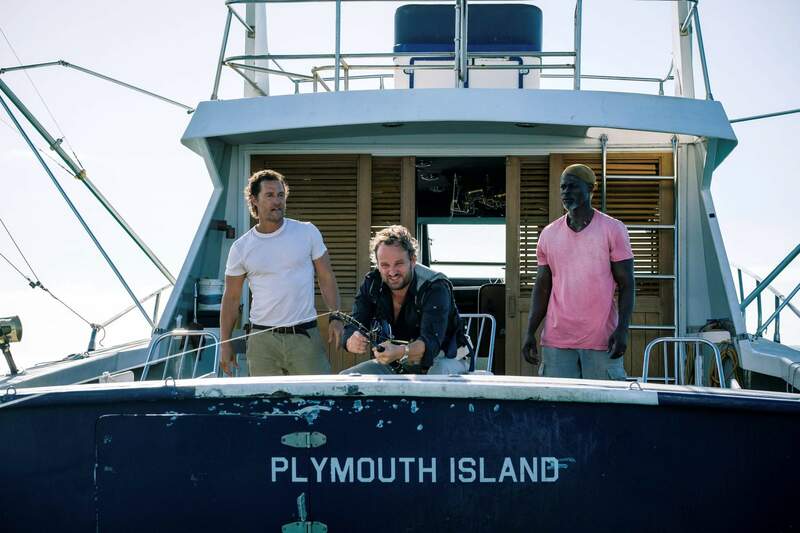 She begs Dill to save her – and their young son – from her new, violent husband (Jason Clarke) by taking him out to sea on a fishing excursion, only to throw him to the sharks and leave him for dead. Karen’s appearance thrusts Dill back into a life he’d tried to forget, and as he struggles between right and wrong, his world is plunged into a new reality that may not be all that it seems. Rated R.
The Kid who would be KingOld school magic meets the modern world in this epic adventure. Alex (Ashbourne Serkis) thinks he’s just another nobody, until he stumbles upon the mythical Sword in the Stone, Excalibur. Now, he must unite his friends and enemies into a band of knights and, together with the legendary wizard Merlin (Patrick Stewart), take on the wicked enchantress Morgana (Rebecca Ferguson). With the future at stake, Alex must become the great leader he never dreamed he could be. Rated PG. GlassFrom “Unbreakable,” Bruce Willis returns as David Dunn, as does Samuel L. Jackson as Elijah Price, known also by his pseudonym Mr. Glass. Joining from “Split” are James McAvoy, reprising his role as Kevin Wendell Crumb and the multiple identities who live within, and Anya Taylor-Joy as Casey Cooke, the only captive to survive an encounter with The Beast. After the conclusion of “Split,” Glass finds Dunn pursuing Crumb’s superhuman figure of The Beast in a series of escalating encounters, while the shadowy presence of Price emerges as an orchestrator who holds secrets critical to both men. Rated PG-13. The UpsideA recently paroled ex-convict (Kevin Hart) strikes up an unusual and unlikely friendship with a paralyzed billionaire (Bryan Cranston). Rated PG-13. A Dog’s Way HomeA dog embarks on a 400-mile journey home after she is separated from her human, Lucas, an aspiring medical student and VA hospital volunteer. Rated PG. Aquaman“Aquaman,” reveals the origin story of half-human, half-Atlantean Arthur Curry and takes him on the journey of his lifetime – one that will not only force him to face who he really is, but to discover if he is worthy of who he was born to be ... a king. Rated PG-13. Mary Poppins ReturnsMichael and Jane are now grown up, with Michael, his three children and their housekeeper living on Cherry Tree Lane. After Michael suffers a personal loss, the enigmatic nanny Mary Poppins re-enters the lives of the Banks family, and, along with the optimistic street lamplighter Jack, uses her unique magical skills to help the family rediscover the joy and wonder missing in their lives. Poppins also introduces the children to a new assortment of colorful and whimsical characters, including her eccentric cousin, Topsy. Rated PG. BumblebeeOn the run in the year 1987, Bumblebee finds refuge in a junkyard in a small Californian beach town. Charlie (Hailee Steinfeld), on the cusp of turning 18 and trying to find her place in the world, discovers Bumblebee, battle-scarred and broken. When Charlie revives him, she quickly learns this is no ordinary, yellow VW bug. Rated PG-13. Spider-Man: Into the Spider-VerseA fresh vision of a different Spider-Man Universe, with a visual style that’s the first of its kind. “Spider-Man: Into the Spider-Verse” introduces Brooklyn teen Miles Morales and the limitless possibilities of the Spider-Verse, where more than one can wear the mask. Rated PG.